SAMSUNG announces Notebook 9 Pen and Notebook 9 (2018). 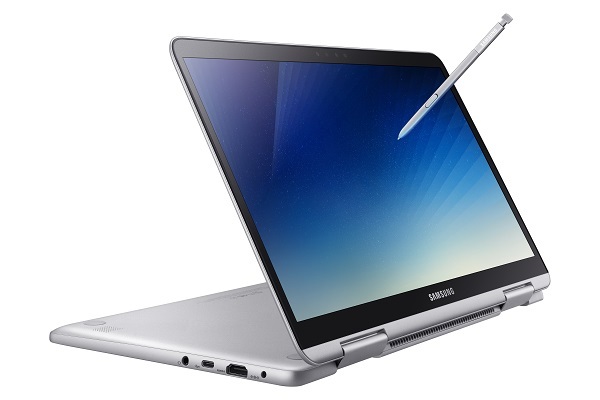 Samsung Electronics today announced the new Samsung Notebook 9 Pen and three new versions of the Samsung Notebook 9 (2018). These four new notebooks are lightweight, powerful and features a long-lasting battery. The new Samsung Notebook 9 Pen comes with a built-in S Pen too. Both devices come with Windows Hello built-in for secure authentication through the fingerprint sensor without having to type in a password, while the Notebook 9 Pen also features an IR front-facing camera for facial recognition login through Windows Hello. Both PCs feature the Privacy Folder for storing sensitive data. The RealView display on the new Samsung Notebook 9 Pen and Notebook 9 (2018) brings a bright and accurate premium image, with lifelike colors and incredible brightness ideal for using the device both indoors and out. Both devices also feature the latest 8th generation Intel Core i7 processor and Samsung Dual Channel Memory for quick speeds to handle jobs like running multiple programs or viewing and rendering high-quality graphics without reduced performance or speed. Samsung offers several tools that appeal to tech-savvy professionals such as Samsung Link Sharing, which allows users to transfer videos, photos and documents stored on their PC to another computer or smart device. Additional software solutions available on both devices include Samsung Message that enable users to send messages from their PC to contacts saved on their smartphone, as well as preinstalled Voice Note for voice-activated note taking, and Studio Plus for custom content creation and editing. The Notebook 9 Pen brings a thoughtfully refined design to the 2-in-1 PC. Its full metal chassis with premium magnesium aluminum - lighter than aluminum - alloy called Metal12 provides durability while keeping it super light at 2.2 pounds. The 360 degree hinge provides flexibility for users to convert to a tablet from a laptop with ease by rotating the keyboard behind the screen for convenience. With three different versions offering a 13.3" to a 15" screen and enhanced graphics capabilities, the Notebook 9 (2018) weighs up to 2.84 pounds and measures 15.4mm, one of the lightest and thinnest notebook devices in its class. The bezel around the screen measures 6.2mm providing a more immersive experience. This means great portability without sacrificing screen size, as well as a stronger, more durable metal body featuring Metal12 which provides durability while keeping it super light. The device also provides always-on power thanks to the 75Wh Hexacell battery, Samsung's largest and most powerful battery placed inside a notebook. For the times when charging is necessary, it also supports fast charging.